On February  13, the OCA joined in the action at CMCC for the 2019 Practice OpportUnity Conference. As a proud event Title Sponsor, we brought back the popular Practice Realities Panel – a dynamic panel discussion with four chiropractors about their real life career path challenges and successes. 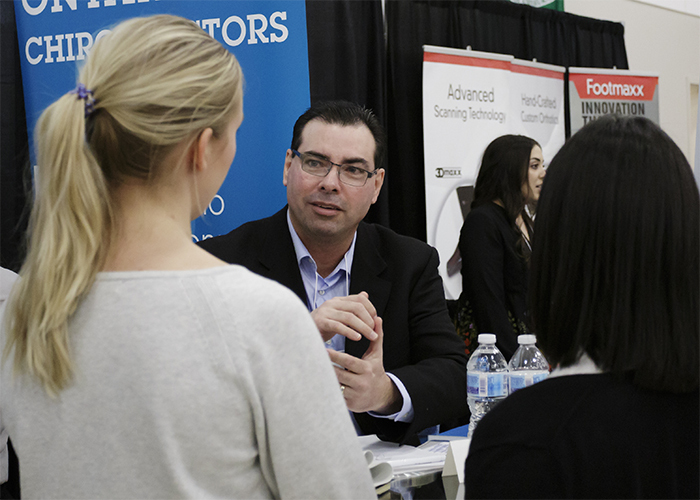 Students got to experience the transformative power of mentorship by connecting with established chiropractors at our Speed Mentoring event. At our booth, students spent time with OCA team members to learn about membership benefits and got an exclusive advance look at our new OCA Aspire software. 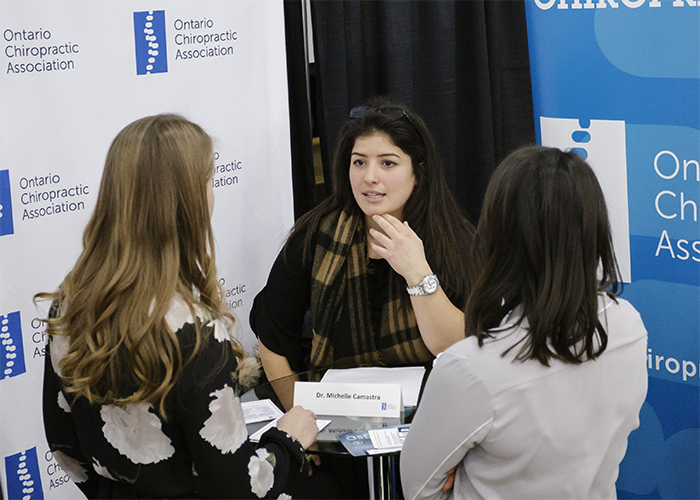 The OCA is committed to supporting students along their journey to becoming licensed chiropractors. Our event booth was buzzing with students wanting to learn more about  Aspire and sign up for our free student membership. Practice OpportUnity ’19 provided a wonderful opportunity to introduce students to our latest tech innovation – OCA’s Aspire! Our new software will enable a practice to go paperless: Aspire is voice enabled; provides offsite access and auto backup; and incorporates PMP compatible note taking from any device, virtually anywhere. We got positive feedback from students about Aspire; how it supports a patient-centred approach and furthers patient portal integration. Aspire‘s responsive and interactive design was also appreciated. 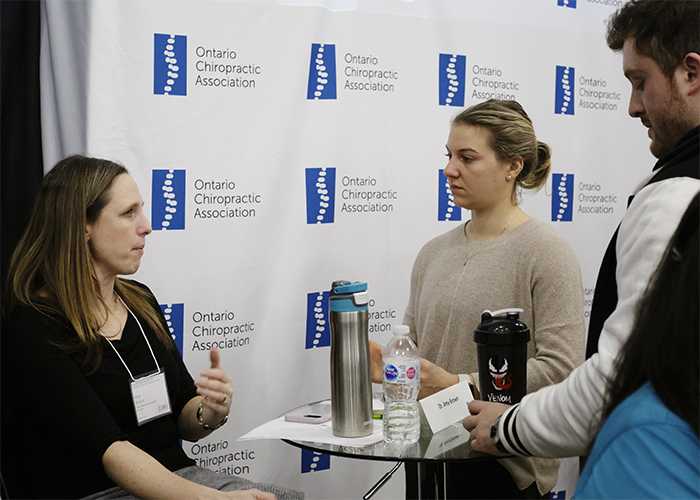 At our  Speed Mentoring  event students got to experience the transformative power of mentorship by connecting with established chiropractors. This event is an amazing opportunity for a fun, high energy Q&A that enriches students with career knowledge and valuable real life insights. Our Mentors for Practice OpportUnity ’19 were Dr. Amy Brown, Dr. Michelle Camastra and Dr. Darcy Driscoll. To learn more about our Mentors click here. This year’s Practice OpportUnity ’19 panel featured four chiropractic professionals with dynamically diverse career paths. During the panel discussion they shared real life scenarios and challenges they faced establishing their careers. This year we brought incredible chiropractic talent to the panel: Dr. Darcy Driscoll, Dr. Michelle Camastra, Dr. Moez Rajwani and Dr. Amy Brown. Students tell us this event is an inspiring experience. Question 1: Describe how patient-centred care is used in your practice to shape your patients’ experience? Question 2: Please discuss challenges in your career and the actions you have taken to overcome them. Question 3: Describe collaborative relationships you developed and how they have helped your practice and your patients. Question 4: What has been the driving force behind the success of your career and what advice do you have for our future chiropractors? What business advice would you give concerning staying within scope of practice? Find your niche. Identify your strengths and market them. Build genuine relationships in your community and health network. Surround yourself with experienced professionals and mentors. 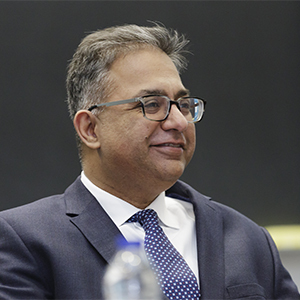 Dr. Moez Rajwani is Vice President of Clinical Services at North York Rehabilitation Center where he manages and works with a multidisciplinary team of medical consultants overseeing complex medical evaluations. Additionally he is the OCA’s Health Policy Officer, providing policy advice on auto insurance and other areas. Dr. Rajwani has a long history of practical experience in our profession and the public health care sector, including expertise in occupational health and sport sciences. 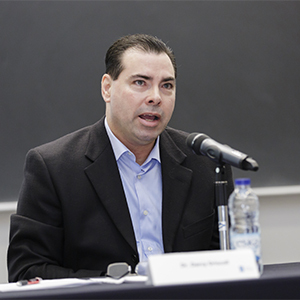 He is presently a board member at the Michael Garron Hospital and he also serves as the co-chair of the Coalition of Health Professional Associations in Auto Insurance Services in Ontario. Other accomplishments include serving as a board member for World Spine Care and Access Alliance Multicultural Health and Community Services, which provides health care services to marginalized members of the community including refugees and new immigrants in the GTA. 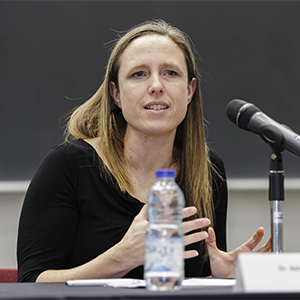 Dr. Amy Brown divides her time between a community-based multidisciplinary practice and a practice within Langs Community Health Centre in Cambridge which is currently part of an innovative Ontario Works pilot with the Region of Waterloo. She sees a variety of patients who are jointly managed with a physiotherapist and massage therapists. Dr. Brown sits on her local Health Links Steering Committee and is involved with the LHIN sub-region health leadership planning table. She is also a consultant for the OCA Outreach program. 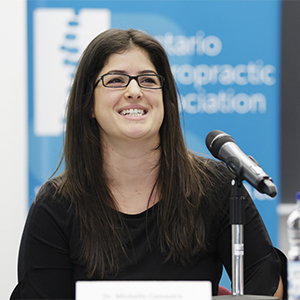 Dr. Michelle Camastrastarted practicing as an independent contractor in a multidisciplinary clinic in Newmarket after graduation, eventually becoming the sole proprietor of a clinic in Oshawa with two chiropractors, a physiotherapist and two reception staff. Her entrepreneurial spirit helped her learn the business of running a practice early on. Her goal for 2019 is to continue growing the business and create a one-stop interprofessional health care centre. Dr. Camastra’s career path over the last three years has provided valuable lessons on starting your own clinic from the ground up. Dr. Darcy Driscoll graduated from Western with a master’s in medical biophysics. He was granted a scholarship to Parker University to study the effects of spinal adjustments on the autonomic and cardiovascular systems. Afterwards he returned to Ontario to start a private practice in Thorold. His many achievements include being on faculty for the Parker Research Institute and the publishing of articles in medical and chiropractic journals. Dr. Driscoll also developed a volunteer chiropractic program at the St. Catharines Community Health Centre (Quest CHC) to help people unable to afford or access chiropractic care. As a result of his efforts there are currently seven chiropractors who volunteer to help people in the local community through this program.